Edin Dzeko boasts a better goals-to-game ratio than Cristiano Ronaldo and Lionel Messi at international level, and Bosnia-Herzegovina colleague Miralem Pjanic has emphasised the Roma striker's value to his country ahead of his record-breaking 95th cap. 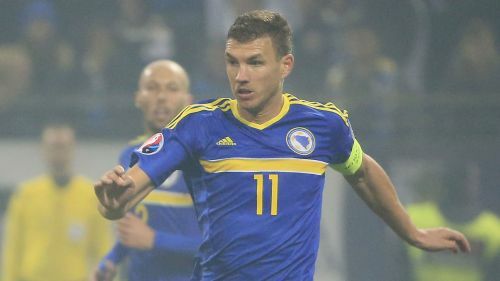 Bosnian captain Dzeko will succeed Emir Spahic as his country's most capped player should he feature against Austria in the Nations League on Tuesday night. The 32-year-old has scored 52 international goals in his 94 appearances to date and his goals-to-game ratio is marginally better than Ronaldo's for Portugal and Messi's for Argentina. Dzeko also became the first man to score at least 50 goals in three of Europe's top five leagues earlier this year, having done so with Wolfsburg, Manchester City and Roma, yet he does not tend to garner the same acclaim that other leading strikers across the continent get. However, Juventus midfielder Pjanic, who played with Dzeko at Roma, insists the striker commands plenty of respect at home. "I don't think he's under-rated - he's done great things recently," Pjanic told Omnisport. "For the national team he's the guy who's scored the most goals. We know that he's important. "He does important things for his club. I think he's a great player, so he's not under-rated."